If you’re among those 66 percent-ers, it’s okay. After all, failure is just a stepping stone on the path to success. To help you recalibrate your content strategy for high-flying results, we’ve highlighted how six B2B brands use content marketing to fuel their business and what you can learn from each one. B2B Marketer Takeaway: Use authentic stories to reinforce your content and increase brand advocacy as 80% of people consider authenticity of content as the most influential factor in following a brand. MYOB, a finance management tool for both large and small businesses in Australia, focuses their content strategy around educating their clients. After all, taxes are a hard code to break. One of the most successful resources they offer is the End of the Financial Year tool, where visitors click on important dates throughout the year to receive tax time to-do’s and tips. It’s an ingenious way for MYOB to demonstrate their expertise and reinforce their authority on business tax. We have no doubt that many clients and prospects have bookmarked this tool in their internet browser, making MYOB their go-to resource for tax time in Australia. The fundraising platform, Classy, knows exactly who their client is: nonprofits. But they found out early on that their growth was directly impacted by how well their clients operated. To combat this, Classy created a content strategy centered around education. Their blog and resource center is loaded with eLearning courses, guides, and webinars on nonprofit marketing, fundraising, and operation. With this strategy, Classy’s clients are raising record-high dollar amounts and driving Classy’s growth. Need Another Jolt of B2B Content Marketing Inspiration? Check out our latest post on how our own content team finds B2B content marketing inspiration. Or if you’re looking for more content examples, get an in-depth look at 38 B2B content marketing case studies. 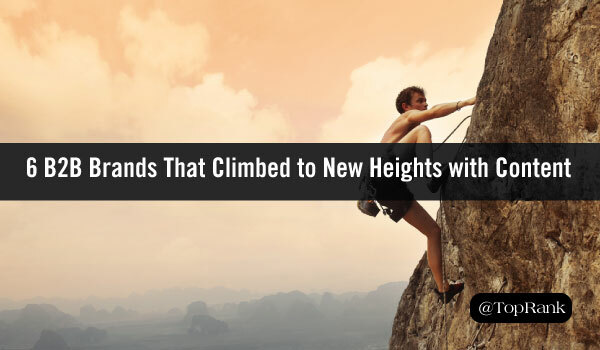 The post How 6 B2B Brands Climbed to New Heights with Content Marketing appeared first on Online Marketing Blog – TopRank®.